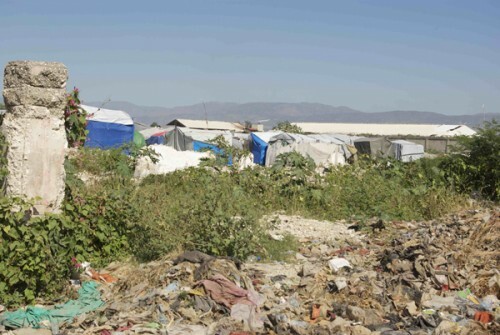 City Soleil is the largest slum on the edge of Port of Prince, the capital city of Haiti. Most of its 300,000 residents live in extreme poverty without running water, sewers, and electricity. 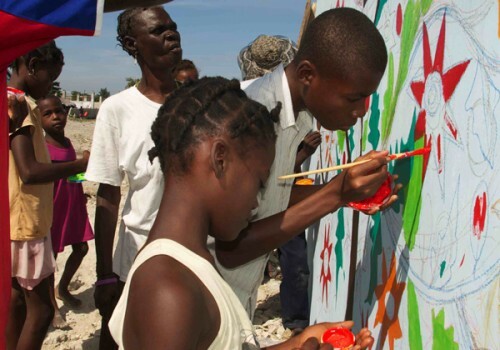 The area has been called a microcosm of all the failings in Haitian society: widespread unemployment, illiteracy, non-existent public services, unsanitary conditions, rampant crime and violence. 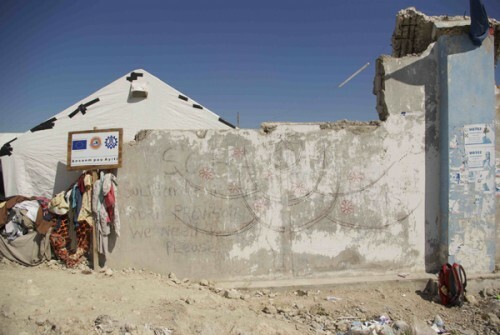 After the earthquake in 2010, the people here continue to endure untold difficulties and sufferings. 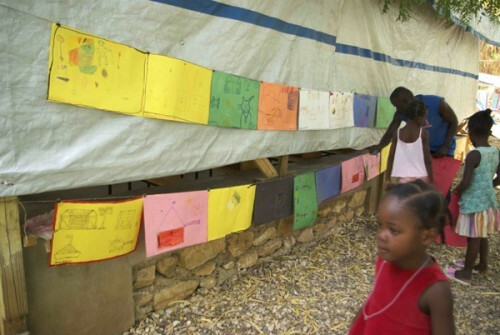 Johanna Berrigan, House of Grace Catholic Worker from Philadelphia, PA and Bishop Tom Gumbleton from Detroit, MI, have been accompanying the people of the St. Claire’s parish community through their Haiti health care project in Port au Prince since 2004. 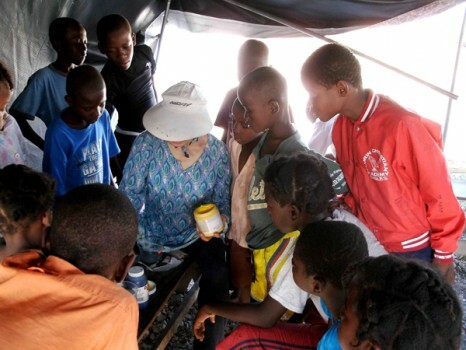 Johanna and Tom have traveled to Haiti six times since the January earthquake, bringing medical supplies, medicine, IV fluid, and water purification tablets to treat survivors of the earthquake who are now suffering from cholera. 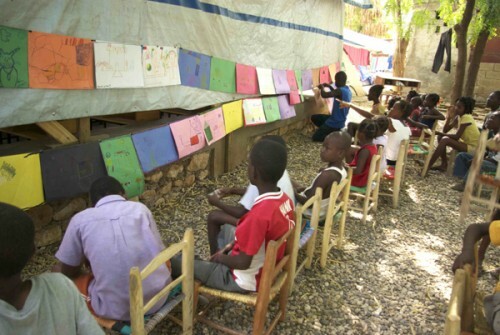 In addition to bringing these supplies, Johanna and Tom continue to hold health education seminars in various communities during their visits, and provide educational materials to be distributed. 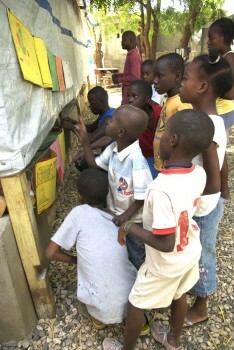 To make their work sustainable, Johanna and Tom established the Kay Lasante Clinic, a project for health care in City Soleil, and a community outreach center for health education and disease prevention services. 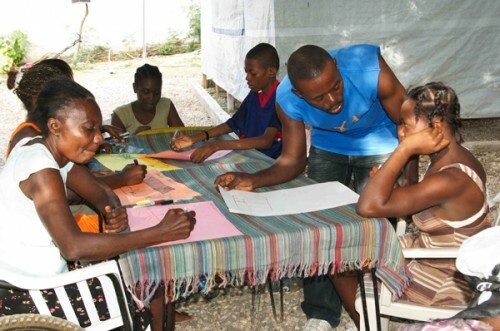 A Haitian doctor, Joey Prosper, and a team of Haitian health care workers operate the clinic. 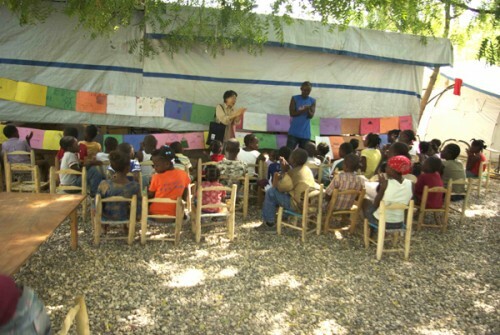 Joining Johanna and Tom’s five-member delegation, Lily Yeh visited Haiti in late November 2010 to conduct workshops for children and disabled members of a community living in tents adjacent to Matthew 25 House. 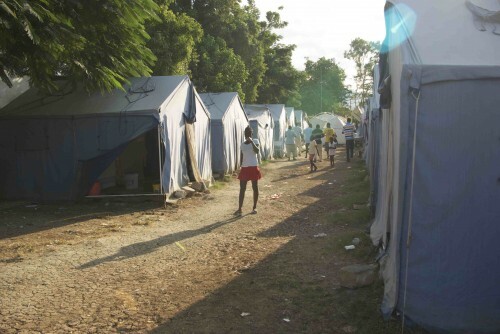 A highly effective and compassionate hospitality center, Matthew 25 House has been managing a temporary school for two hundred and sixty children in the tent community. Lily Yeh loved working with the children as they expressed themselves. She was most moved by the reactions of the disabled people who participated in the workshops. 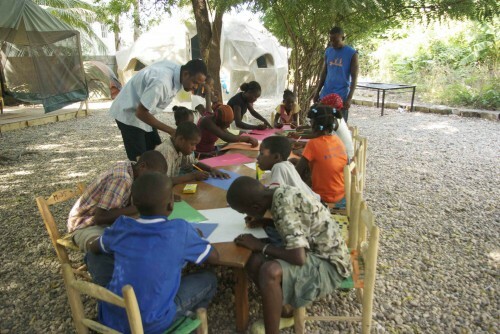 Working with Daniel Tillias, our host, local activist, project director of the Pax Christi soccer club for the children in City Soleil, and liaison for Kay Lasante Clinic, Lily Yeh conducted a workshop for dozens of children to make dream flags and drawings about themselves. 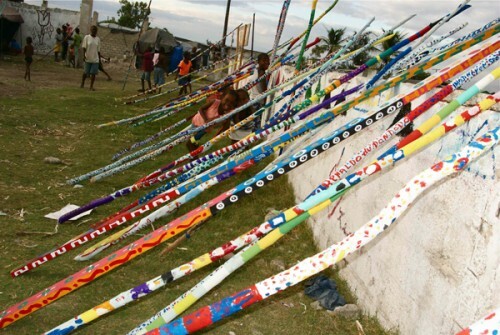 The children also painted thirty twenty-foot poles, which will function as a fence around the Pax Christi soccer field. 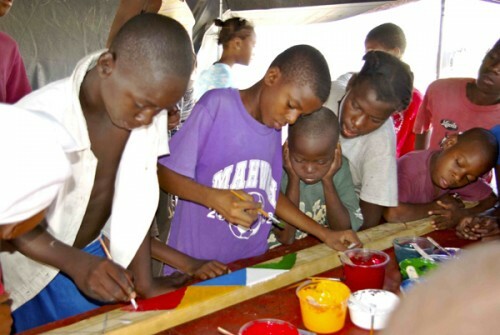 To see the smiles on the children’s faces and the joy that these activities brought, was truly uplifting. 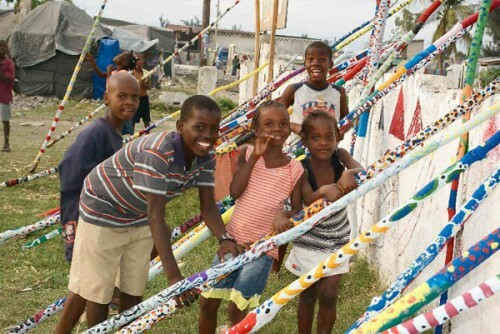 Throughout the process, Lily Yeh was able to pass on her methodology to her three Haitian assistants in how to engage children in creating beauty. 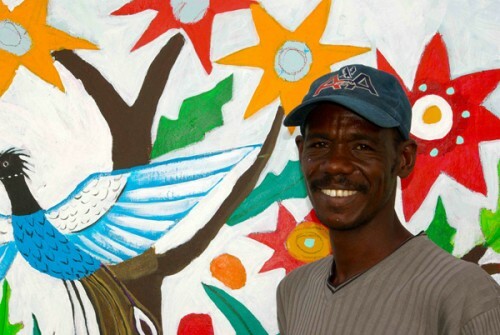 Daniel Tillias’ envisions a transformed Haiti that begins in the heart of City Soleil. The transformation will happen through creating beauty. 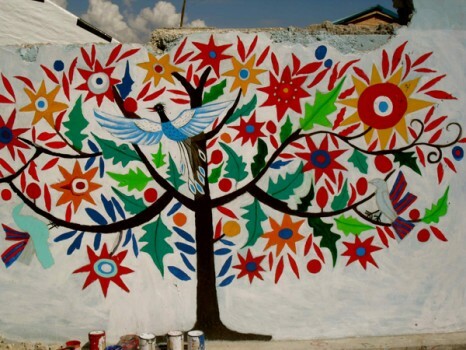 Responding to that vision, Lily Yeh designed a Tree of Life in Haitian style on the ruined wall that separates the main street from the camp for the disabled and elderly. “When people see beauty arising from City Soleil, they will sense that transformation has begun,” commented Daniel Tillias. 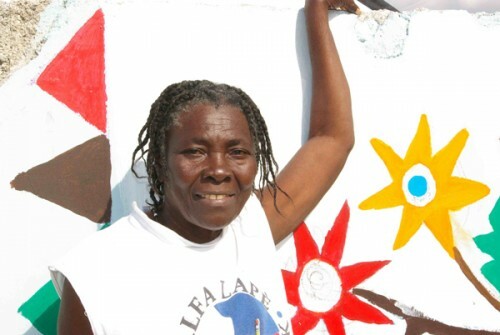 With the help of her assistant Louissaint Woody Alcide and over a dozen of children and adults, Lily Yeh completed a vibrant mural of the sun, star-shaped flowers, and lush leaves with colorful tropical birds. “Jolie, tres jolie, Mesi bokou.” (Beautiful, very beautiful. Thank you.) People smiled and wanted their pictures taken in front of the mural. 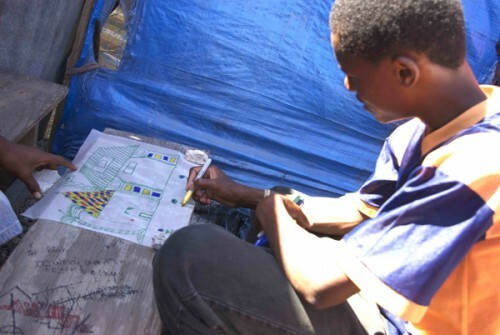 Residents of this camp are the most vulnerable and we found a way to engage them. 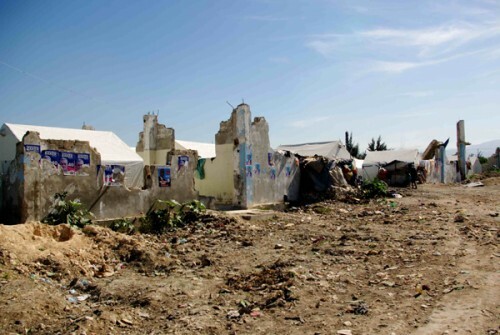 They live in tightly placed white colored tents, which are held down by numerous grey concrete blocks, an environment with so little color. 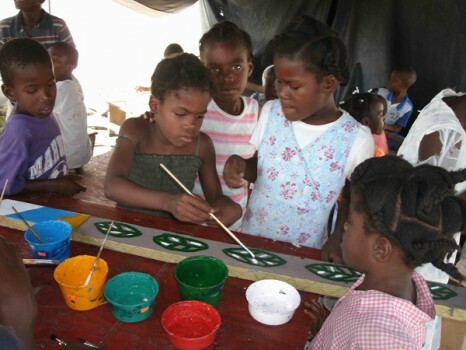 We provided them with white paint to prime the surface of the blocks on which they then dotted and patterned with various colors. 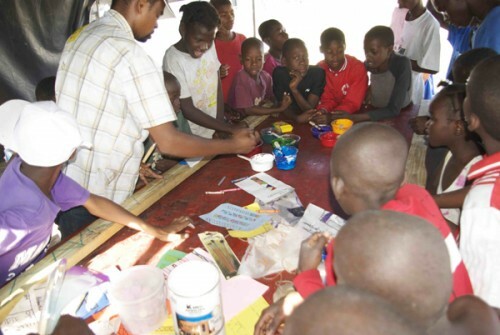 The joy of creativity was palpable in the camp. It was like the spirit moving through the people, gently touching and comforting. To learn more about this project, please visit BishopGumbleton.com. 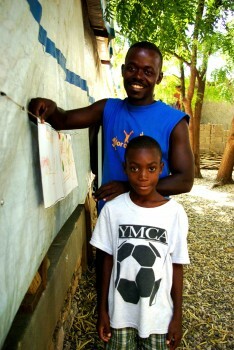 The town of City Soleil, our project site. 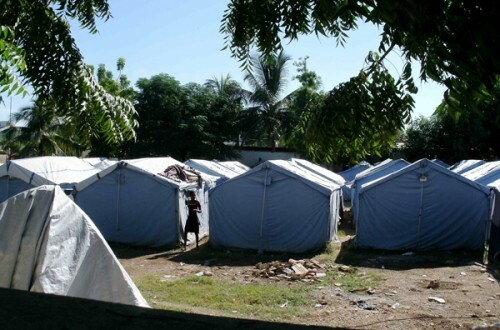 The tent community of City Soleil. Lily Yeh's Awakening Creativity workshop begins. 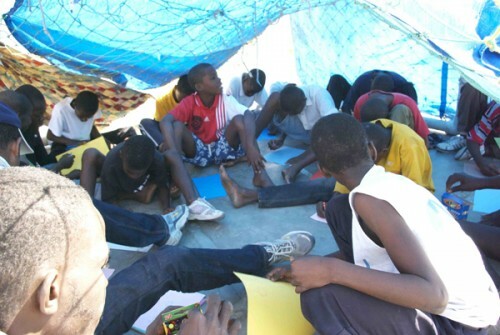 The students happily work in their tent classroom. One of the beautiful drawings from the Awakening Creativity workshop. Symbols of movement and transpiration are juxtaposed with images of stability, deep roots, and home. 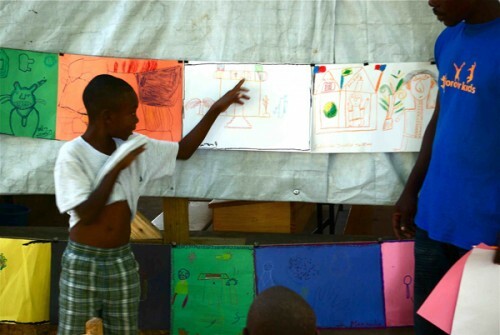 Woody, our wonderful Haitian translator and workshop helper, hangs drawings created by the children. Everyone crowds in to see the artwork. Now it's time for people to speak about their artwork and ask each other questions. 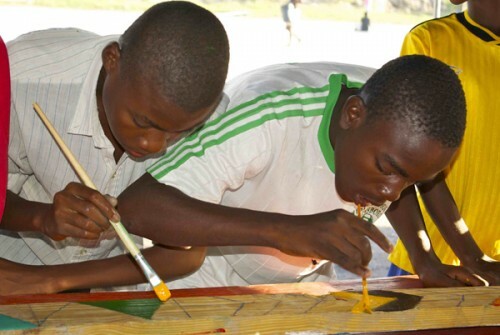 The children enjoy sharing their creations. Many people loved speaking about their drawings. Lily Yeh, Woody, and the group of artists pose together. 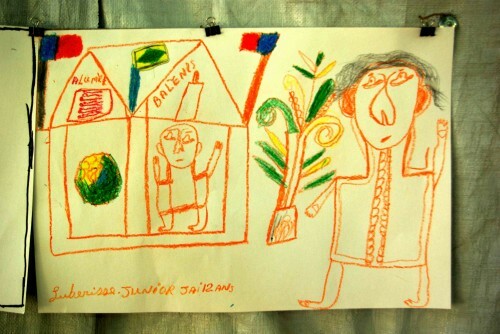 This Awakening Creativity workshop engaged elderly community members and people who were disabled by the earthquake. 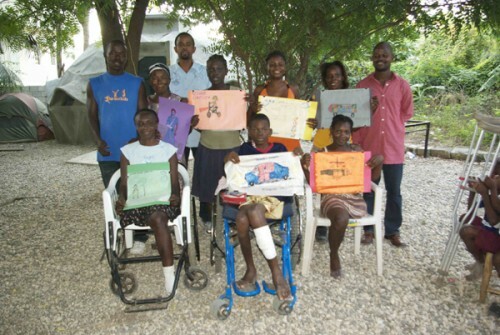 This Awakening Creativity group poses with their final drawings. Bore the Awakening Creativity workshop, this young person was despondent and lethargic. 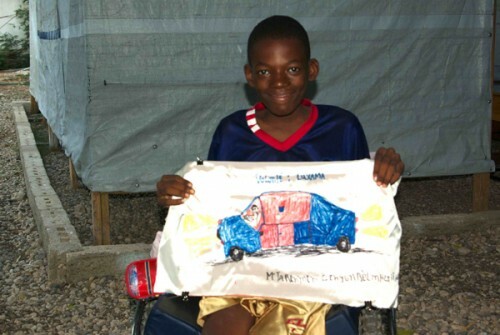 After the workshop he was lively and enthusiastic, eager to share his drawing of a car with community members and volunteers. 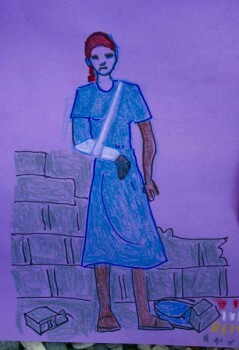 A self-portrait of a woman injured by the earthquake. 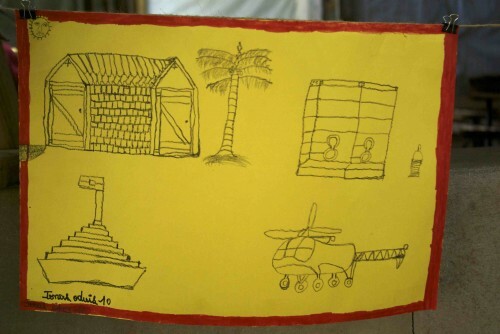 Lily Yeh also had the children create dream flags. 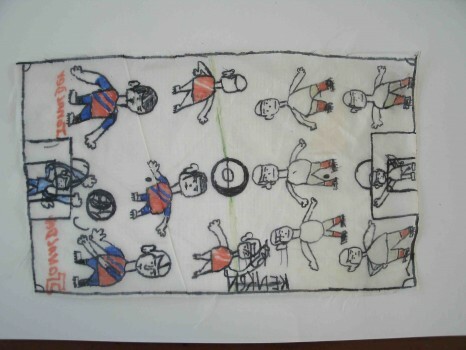 This banner depicts a soccer game. 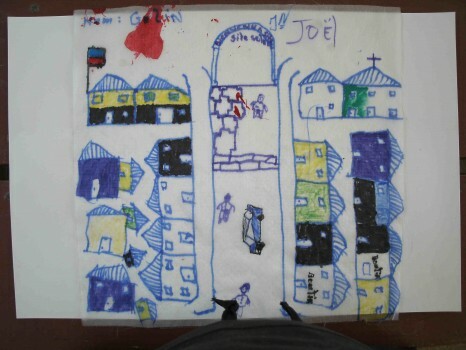 This dream flag maps out the City Soleil community. A view of City Soleil. The future site for our mural project. 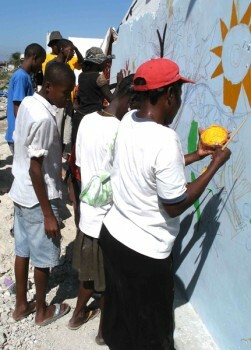 You can see a light sketch for The Haitian Tree of Life mural on this wall. 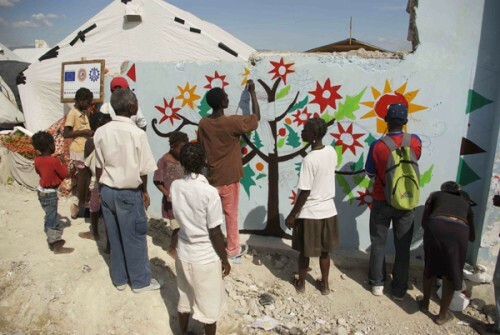 Getting started on The Haitian Tree of Life mural. 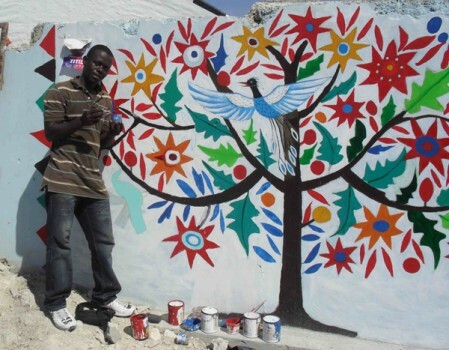 The Haitian Tree of Life begins to blossom. 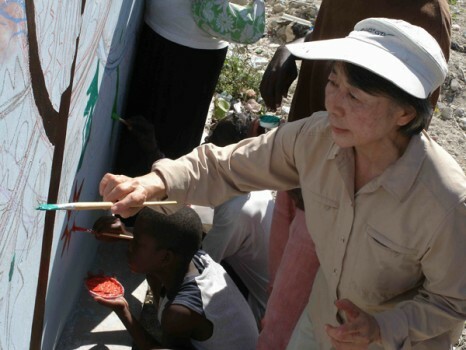 Lily Yeh happily gets to paint some of The Haitian Tree of Life mural too. 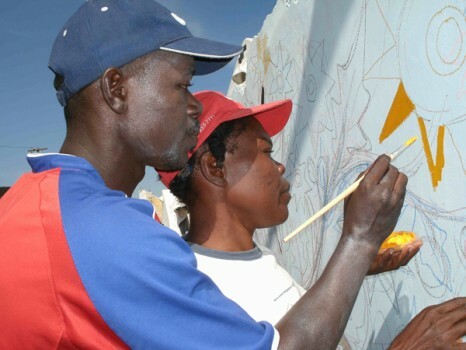 Deep in concentration painting a flower on The Haitian Tree of Life mural. It's exciting to see the mural come to life. 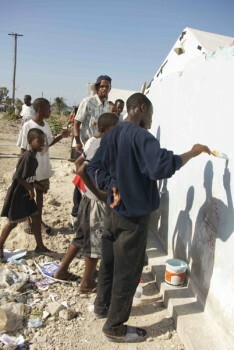 Community members were entranced by the creative process. 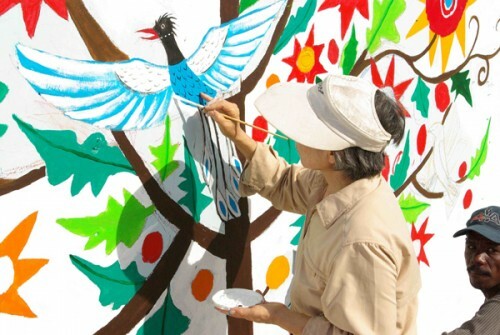 Lily Yeh paints a tropical bird who will live in The Haitian Tree of Life. Many people wanted their photographs taken in front of the mural. Full of joy and hope for City Soleil. Putting the final touches on the mural. 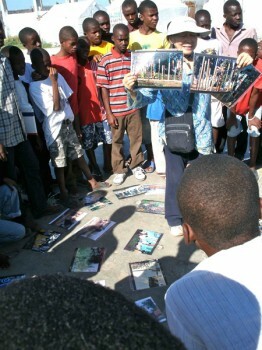 Lily Yeh shows the children pictures of painted poles from a different Barefoot Artists project. 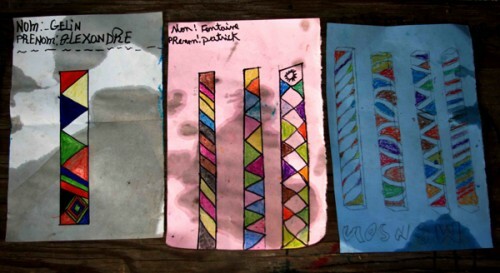 The children's sketches for painted poles. Lily Yeh gets the painted poles workshop started. Many children are excited to work on this project. Deep in concentration, these young people happily work side by side. 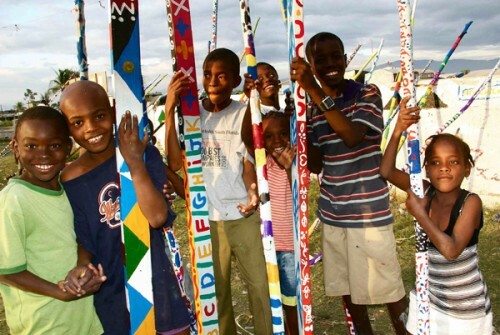 A group of children pose with the colorful painted poles. The gorgeous poles, all lined up together, sing with beautiful energy. Beautiful energy, friendship, creativity, and hope.